For those who’ve been reading therockmom for a while, you know that I try to write something different than the usual proud mom, naval-gazing kind of blog. Music is my main interest, but as it turns out, my parenting posts are always my most popular reads. However, I don’t know about you, but I really don’t need or want to read about toilet training or first words or fussy eaters. We’re years beyond that anyway. I also don’t want to put my kids on show all the time, and I figure it makes more sense to make fun of myself and my foibles as a parent instead of oversharing about my girls. After all, it’s not their choice that I write about being a mom. 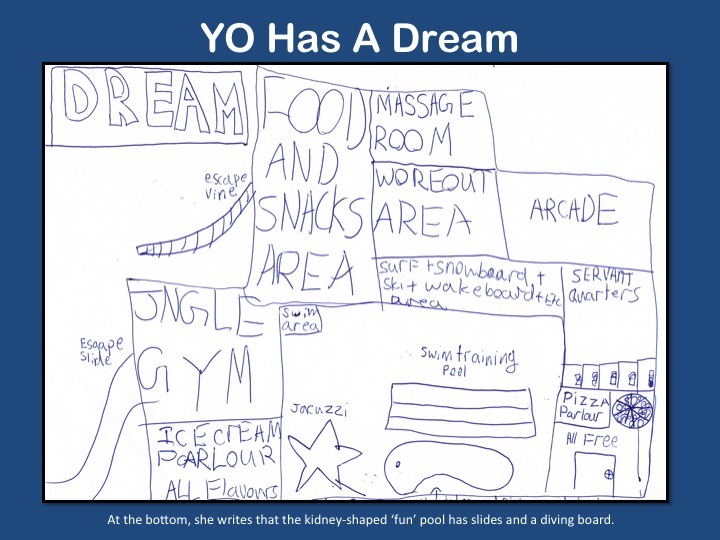 But today I’m going to make an exception and share YO’s drawing of her perfect house, which is just so wonderful and funny and precious. We should all live in a place like this! Plenty of food and play areas, and two escape routes, just in case. I especially like the generous space she’s allotted for the massage room – right next to the ‘woreout’ area, which is I guess where you go after you’ve had a tough day. I’m hoping that’s where the wine fridge and magazines will be. And of course being a Hong Kong kid, she’s got room for servant quarters, natch. We all need to dream. What’s yours? Do you think there’s a real estate site for these places?